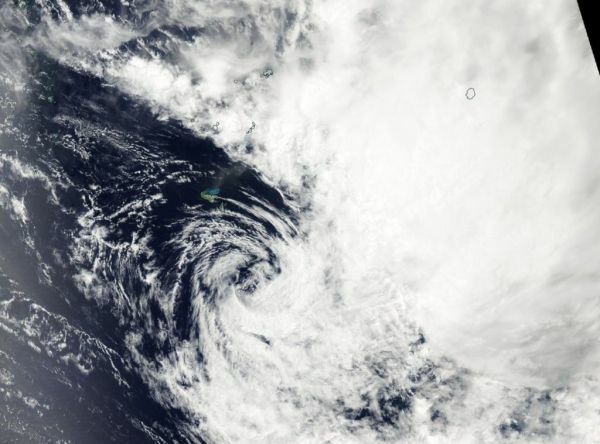 Tropical Cyclone Neil had a short life in the Southwestern Pacific Ocean. It developed on February 9 and dissipated on February 10. Tropical Cyclone Neil had a short life in the Southwestern Pacific Ocean. It developed on February 9 and dissipated on February 10. NASA’s Aqua satellite captured an image of the storm that developed even while battling wind shear. Neil developed around 4 p.m. EDT (2100 UTC) on February 9 about 302 nautical miles west-southwest of Niue with maximum sustained winds near 35 knots (40 mph/65 kph). Niue is a small island nation in the South Pacific Ocean. According to the official website of Niue tourism, Niue is one of the smallest countries and one of the largest raised coral atolls on Earth. On Feb. 10, Tropical cyclone no longer qualified as a tropical cyclone. At 4 a.m. EDT (0900 UTC) Neil was dissipating near 24.0 degrees south latitude and 173.9 east longitude, about 369 miles southwest of Niue. Neil’s maximum sustained winds had already dropped to 30 knots (34.5 mph/55.5 kph) and continued weakening.